In the Alps, winter is something special, to the point that it opposes two, rather stereotyped images. The first, not as terrible as it is made out to be, is of snowed-in mountain families suffering from the cold, a fundamental image in the Alpine legend. The second, not as wonderful as it is made out to be, is of city dwellers in search of fun and nature, travelling each year to play in the snow on the slopes. Avalanches are part and parcel of winter. A threat inherent to mountains, an integral component of life that mountain dwellers managed in a collective manner. Today considered inacceptable, the risk of avalanches is a notable element in Alpine culture, as is shown in the archives from the 1700s. Put ice in your long drink ? Prepare a strawberry sherbet ? Very easy nowadays. But it was not always so easy. The Italian custom of cooling food and beverages with ice, though initially contested, launched a profitable winter activity in the mountains. Odd buildings, called ice houses, bear witness to that activity, particularly in the southern Alps. Tales of fairies, wild things, returning spirits, poltergeists and diabolical animals frightened and occasionally amused the persons around the fire during the long winter evenings of yesteryear. Two stories. In Vallorcine (Haute-Savoie department), the inhabitants were liberated from their winter prison in 1907. The new train line to Chamonix included a tunnel that finally connected them to the rest of the world. A vital link for the secluded valley. Aimée Bigallet started her teaching career in 1921 in the Étages hamlet at an altitude of 1 603 metres in the Haut-Vénéon section of the Oisans range (Isère department). She discovered the true Alpine environment and the isolation of a small community cut off from the rest of the world by unending snowfall. Over the long winter months, she made daily notes on the hard life and activities of the farming/mountain guide families. The fascinating account was published the following year in the prestigious Revue de géographie alpine. The photographic collection of the Musée dauphinois contains almost 100 000 images ! Rummaging through the wonderful archives spanning over a century of human history in the Alps is like discovering Ali Baba’s cavern. Urban architect Laurent Chappis is inventing a future for mountains, at 95 ! A refreshing view that turns it back on large developments and places humans in the centre of each project. A meeting with his friend and fellow architect Jean-François Lyon-Caen. In direct opposition to the mandatory enthusiasm for snowy slopes, the author here uses humour to state his case that one can be Swiss and not like skiing. 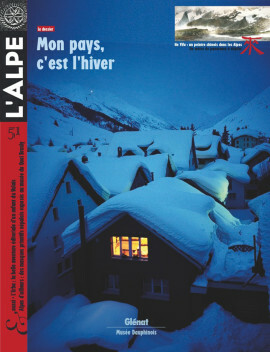 A heartfelt cry that follows other very personal accounts published in the ten-year anniversary issue of L’Alpe. A lover of the cold season has put together a fanciful and necessarily partial inventory of winter, something of a glossary lifted from his many travels, ranging from the Massif central to Québec, with the Alps somewhere in between. He Yifu paints the Alps in a manner inspired by traditional art forms from his country. His poetic works represent a fresh break in our classic vision of Alpine landscapes. An exhibition of his work may be seen in Grenoble. A series of masks, a particularly vivid form of Nepalese tribal art, looks the visitor right in the « whites of the eyes » at the Musée du Quai Branly in Paris. Ancestors ? Demons ? Fools ? Mythical characters ? In their violent strangeness, the wooden masks constitute an unsettling encounter. Raymond Lonfat undertook an in-depth investigation to find his ancestors who opened up the Trient valley in the Valais canton of Switzerland. A historical and publishing adventure that resulted in two magnificent, illustrated volumes. Perhaps the starting point for a series of novels ?